Welcome to Planet Vampire! Whether you're a White Wolf fan, a fellow gamer, or a wandering soul who lost their way and wound up here, you'll find something for everyone. 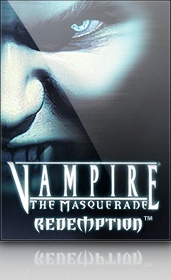 We are the number one fansite for White Wolf's Vampire Role Playing PC games. Here you will find info, art, mods, patches, fan creations, and on-going discussion on the pen and paper (P&P) RPG and the PC games Vampire: the Masquerade - Redemption (VtMR) and Vampire: the Masquerade - Bloodlines (VtMB). We also have a discussion board dedicated to the upcoming MMO, which is tentatively titled World of Darkness and is currently being co-developed by CCP (of EVE Online fame) and White Wolf. Full of dedicated role-players, gamers, modders, and storytellers we do our best to bring you up-to-date news on White Wolf releases, state-of-the-game news, in depth game discussions, lovingly made fan creations, and much more. Make sure that you have the latest version of the official patch installed to ensure the best and most reliable performance from the games. The current final official version for Redemption is v1.1, and for Bloodlines it is v1.2. Bloodlines also has a very well-made unofficial patch, which will bring you to v6.7. Visit the Bloodlines Patches area to get any version of the unofficial patch after and including v3.6. Forum member "Bojo_Bones" pointed out a site called GOG.com (Good Old Games) that has Redemption available for download for only $5.99. You can find it here. Bloodlines Maps being Remade in Redemption! "The Upstart" has begun a project to convert Bloodlines maps to be used in Redemption. You can find pics and discussions in this thread. He intends to convert most of Bloodlines maps to play in Redemption and then start his own chronicle. Official PV Trivia: Episode 7: Country? Connect Johnny Cash to a Vampire PC game in 2 steps or less. Post your response in this thread. Basically, I took the old audio Jav put together with Darklobo and decided Tourettes Guy should be on the film crew and Jav thought it would be nice to add a rant by... Tourettes Guy is a little distracting on the set and well.. you'll just have to watch to see what happens. Enjoy! +Prevented feeding twice from Romero and getting him a rival in love. +Made Tourette give you her gun and forced endgame Skelter dialogue. +Moved frenzy powerup from basement into hollow book in Grout's room. +Forced Nosferatu to use Empire Arms vents and fixed map transition. +Fixed Regent's reward and Yukie bug and improved on her translation. Moved some new props and restored a few more to warrens and Asylum. Restored Fu Syndicate alarm switch sequence and three context icons. Fixed Jack, Isaac and LaCroix dialogues and theatre web log update. Added walkthrough including patch changes, thanks to vampyri_lestat. Moved new raver as DJ into Confession and restored old DJ to Glaze. Fixed intro paintings, added two more and swapped two with Skyeline. Corrected look-through problems of male Tremere and Ventrue models. Removed poster quests from basic patch and added a log for Tourette. Finally fixed Beckett's "wait" freeze bug, thanks to burgermeister. Corrected Heather changing clothes and added Gary to intro sequence. Added missing endgame quest logs and pause key option to keys menu. Restored four female and two male hand skins and Nosferatu eyeballs. Zeromorph and his team have been working on v1.2 of his popular Camarilla Edition mod and it has now been released! The changelog and PV forum discussion can be found here. Another mod on the way is the Midnight Mod by Warrior|$hacar with help from burgermeister. It adds a new quest that can be played by all clans as well as enhanced skins and working mirrors and a few other changes. News will be posted when it's released but the discussion can be found here. Yes. It’s been that long. Vampire the Masquerade – Bloodlines was launched 5 years ago from this day… well yesterday depending on your time-zone (mine is Pacific). So our delayed front page news we’ll blame on urm… lag, yes, lag. Actually Bloodlines launched the 16th in the USA and on the 19th in Europe. An update to the Clan Quest Mod has been released to "patch" some problems 64 bit O/S users were having. The problems should be resolved by downloading this update, you can find it here. -Updated the "Contact Us" page to give a new email address to contact staff and submit a PotD. -Updated the Redemption Troubleshooting thread, along with solutions to help you play online using Hamachi. -Added Dheu's Guide to Modding Bloodlines.